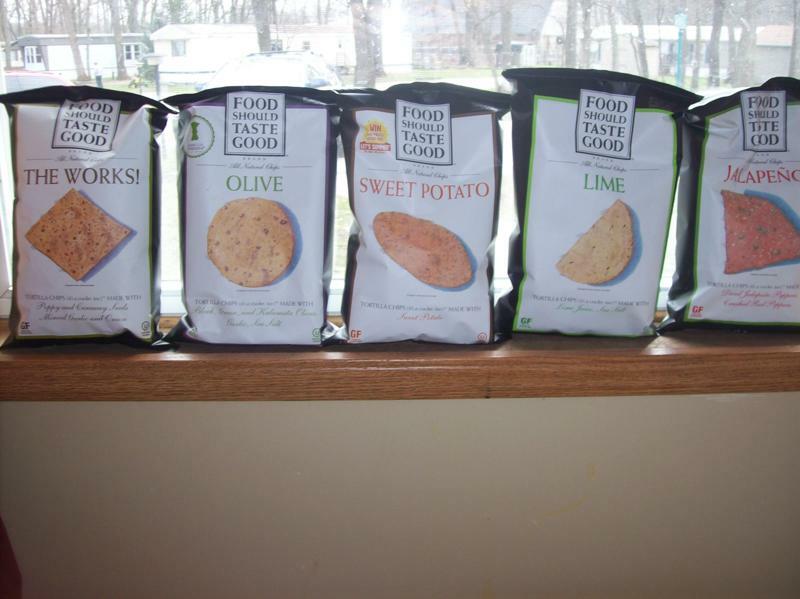 Food Should Taste Good is a company that makes all natural tortilla chips made with real and simple ingredients. Here is a little bit of information about the chips: "All of our chip varieties are free of cholesterol, preservatives and trans fat, and do not use genetically modified ingredients (GMOs). They are also certified Kosher and Gluten Free, lower in sodium, and are a good source of dietary fiber. We currently have 11 flavors in our 5.5oz line: Multigrain, Sweet Potato, Olive, Jalapeño, The Works!, Chocolate, Lime, Blue Corn, Cheddar, Toasted Sesame, and White Cheddar." The flavors that I chose to review were The Works, Olive, Sweet Potato, Lime, and Jalapeno. My favorite of these are the olive chips. They do not really taste like olive (in a good way) but are crispy, salty, and fresh tasting. The company suggests eating them with hummus which is very good too. I love that these chips are good for you and actually taste good. The kinds of flavors are very unique which is another thing that intrigued me about this company. I also really like the sweet potato ones. I am sensitive to a lot of sodium and these chips are pretty low in sodium which is a major plus. A one ounce serving of these chips is 140 calories, has 3 grams of fiber, 2 grams of protein, and 140 mg of sodium. Not too bad at all for chips! I can't wait to try the rest of these flavors of chips! The giveaway will be for 5 bags of chips in the flavors of your choice from Food Should Taste Good. The giveaway is open until Midnight on Tuesday May 10th. Winner will be chosen on Wednesday May 11th using Random.org. The winner will have 48 hours to respond or a new winner will be chosen. Visit the Food Should Taste Good website and let me know which flavor of chips you are most interested in trying. Good luck and have a great Easter! I would most like to try the Jalapeño chips! Hopping through from Surfin' Saturdays! Thanks for visiting my blog and Happy Easter to you as well! Like your Facebook page! Matt S.
Subscribed by GFC. Matt S.
Thanks for stopping by my blog! I am always looking for good snacks like this. I would love to try the LIME. I really want to try the Jalapeño flavor! I entered the lemon giveaway! I would love to try the Sweet Potato! I also entered your honey milk giveaway! I really want to try the chocolate flavored chips! The chocolate flavor looks to die for! I entered your Lemon Ladies Orchard- A dozen Meyer lemons giveaway! I entered your Ozone Sock Giveaway! I entered your Chef's Planet Kitchen Gadgets giveaway! I think that the Works would be the most interesting to try. I'm most interested in trying the Olive chips! I'm most interested in trying the Chocolate flavor. Two pints of larger and a packet of chips! I'd like to try the Jalapeno flavor. That served with cold Mexican beer. Ole! I most want to try the Olive flavor. I am a new follower from the blog hop. Love your blog...I would try the Jalepeno chips...I follow you via GFC. I would like to try the toasted sesame. I'd most like to try the Jalapeno! I'VE ENETER THE HONEY MILK GIVEAWAY. I'd be interested in trying the sweet potato chips! The white cheddar chips look so good! I am wondering what the nut. value is for these since they are natural. Did not see that on the website. I have a son with kidney disease and he needs low sodium food. Always looking for something new. I want to try the sweet potato flavor. i've enter the LEMON LADIES ORCHARD giveaway. I'd most like to try yellow corn. Thanks. I would love to try the cheddar chips. I entered the Lemon Ladies giveaway. I entered the Rudi's Organic giveaway. I entered the Sunshine Pillow giveaway. Sweet potato looks good to me. Entered the Lemon Ladies Orchard giveaway. I am most interested in the sweet potato! I'd love to try The Works!